Can anyone else believe that Zachary is five months old?? I seriously can not. While I can still vividly remember my life before him, these first five months with him have flown by. He is now 26 inches long and 15 lbs. I still like to squish him into this bathtub as I think it keeps him more warm…but am going to have to stop soon. And with the weight gain FINALLY he started sleeping through the night!! I know I am totally going to jinx it by typing it out and he will try to wake up tonight, but for the past 4 days he has gone down at 7:00, tried to get up at 5:30 while I ignore him, then woke up talking to himself at 6:30 where he stays until I get him at 7:00. Bliss I tell you, sleeping is pure bliss. I do think the rice cereal had something to do with it, even to just push his weight up enough to be able to sleep. I am still shoveling it in his tiny mouth just to be safe. Yay sleeping through the night! Right now I just pray for 11pm to 6:30am with Jack! That little man is looking more like his momma all the time. Let’s skype I tell you! 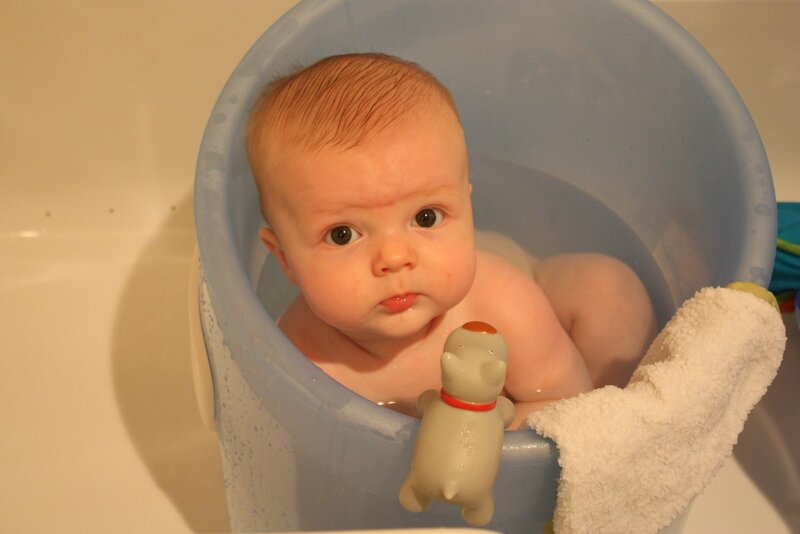 OMG – Love this photo of you smushing him into the bathtub – super cute!